Get your hands on thousands of comics with a monthly subscription. InkyPen includes comics from across the globe, from big-name publishers to indies and webcomics – this includes comics like Hellboy (Dark Horse), Robotech (Titan), Transformers and Judge Dredd (IDW), and Sarah’s Scribbles (Andrews McMeel Universal). Either read InkyPen yourself or set parental control restrictions in the app so you can share age-appropriate comics with younger readers. Read great classics and standalone series. Read comics set in the worlds of your favorite games, TV shows and books. Read across the widest range of genres and tastes available in one app. Subscribe to read it all without limitation! Fun for everyone! It’s time for the crazy kick-off! The desk is your field! Lace up your shoes for a simple yet challenging soccer game! Share the Joy-Con controller with up to 4 people for a soccer free-for-all! Make your own original team by adjusting formations and positions! Aim to win the tournament! Mahjong Solitaire Refresh is a Matching Puzzle game of Mahjong tiles. You do not need any knowledge about Mahjong, you just combine same design tiles! Contains 256 abundant stages! Enjoy the rhythm of removing tiles with Match type “Drag” which has introduced anew! In Pic-a-Pix Pieces, large pictures have been split into a number of smaller pieces. Each piece is a puzzle grid, and by solving them all you’ll form a mosaic that reveals a spectacular final image. Play alone or solve puzzles with friends! Co-op play supports up to 4 players using any combination of controllers. Touchscreen controls can be used in handheld mode. Speed through stunning, stylised environments tracing ribbons of light, releasing the energy in the music. Battle strange enemies and fight epic boss battles all driven by an incredible licensed soundtrack. Independent micro-studio Mad Fellows brings you a unique and innovative game featuring music from Noisia, Flux Pavilion, Katy B, The Prototypes, Neosignal and many more. Earth, 3024. Natural resources are scarce and the survival of the human race is in danger. Desperate to find new energy resources, the ASAN creates a biomechanical robot called Nep2no that is capable of withstanding extreme depths in the hope of finding new energy sources. After many years of exploration, a new energy source is found, code named Gaia. Your mission will be to find the “Gaia” energy stones by exploring the depths. To do so, you must control Nep2no by counteracting gravity and the surrounding darkness with the aid of a Light that will go out little by little. Metal Slug 5 is an action shooting game released by SNK in 2003. The Ptolemaic Army has stolen some very confidential files! Choose from four familiar faces: Marco, Eri, Tarma, or Fio to take them down! Look forward to the new Slug Gunner and slide mechanic! Athena is an action game released by SNK in 1986. Athena, the adventure-loving energetic princess of the Kingdom of Victory, goes on a journey to Fantasy World. Running, swimming, and even flying?! Utilize various weapons to defeat the looming enemies! Think you can defeat Dante, the evil emperor of Fantasy World?! Awe is a god-game about expressing one’s creativity by shaping and building planets’ ecosystems in a tranquil, relaxing ambiance accompanied by exquisite, minimalist lowpoly 3D art and atmospheric music. A constant sense of progression and discoveries will maintain the player’s interest throughout puzzle-like levels, leading him to eventually understand his place and purpose as a god in this universe he has created. The objective is not to make a difficult game, and although some puzzles may seem more complex than others, they are always easily solvable. Follow the journey of a young knight in training, Madelyn, and her ghostly pet dog, Fritzy. They set out on a journey to save her kingdom and her family from the clutches of an evil wizard. The hunt is on! Get ready to battle colossal space monsters in Blacksea Odyssey, a savage, top-down rogue-lite shoot ‘em up RPG. The greatest huntsmen in the universe have gathered for the Blacksea Odyssey – a legendary tournament that plunges competitors deep into the cosmic abyss on a deadly hunt for the most fearsome creatures that dwell within the void. Bring Them Home is an exciting puzzle game in which you must rescue little astronauts. To solve the puzzles, you need to think clever and imaginative. Since each astronaut has unique abilities, complex puzzle worlds must to be mastered to find a way out. Tower of cakes, every child’s dream! Let the kid in you go crazy with sweet and delicious cake towers. Cake Laboratory is a stacking game with a sweet twist to it. Use cakes instead of taking breaks, and make the most delicious tower. A casual game for all family to enjoy, child-friendly and challenging at the same time. On their way to the Chronus Shrine to get the Chronus Fragments, Loka and his teacher Teth are surrounded by a mysterious man named Geppel and his gang. They demand the Fragments. While Teth plays for time, Loka rushes out of the cave on his own to fetch reinforcements. He is successful, but Teth and Geppel are nowhere to be found. Aiming to gather information about his missing teacher, Teth, Loka decides to set out on a journey with his friend Sarna. City Builder combines two classic game mechanics in a fun, bouncy new game where players stack pipes, roads and power lines to form ever-larger cities, moving from one to the next across the planet’s continents. Along the way, they run into a large number of challenges, ranging from clever/pesky Mole-men to the elusive Bigfoot, Aliens, Wandering Hot-Air Balloons, Huge Bonus Levels and much more. In this eagerly anticipated sequel of the game Clouds & Sheep, the cute sheep are finally on the loose again! Solve countless quests and fulfill your wooly friends’ needs. Plant grass, flowers, trees and shear your animals’ different-colored wool to stock up your resources! Collect happy stars, harvest wood and flower petals and use them to provide your flock with food, accessories, toys and more! Control the clouds and make it rain to ensure your sheep never run out of fresh water to drink. If your sheep feel happy and content, they’ll bring tiny lambs into the world! Enjoy two indie favourites from Digerati! This bundle contains colorful splatformer INK and bouncy ball-juggler HackyZack. Donut County is a story-based physics puzzle game where you play as an ever-growing hole in the ground. Raccoons have taken over Donut County with remote-controlled trash-stealing holes. You play as BK, a hole-driving raccoon who swallows up his friends and their homes to earn prizes. Join the fun in this wild fishing action and rush across the seven seas. Fly fishing is boring! Grab your guns and explosives and let’s catch some fish REDNECK STYLE! Forget about idyllic ponds, or beautiful coral reefs. Dynamite Fishing: World Games will ship you to the best fishing spots all over the globe including an awesome jungle adventure! Choose your favorite characters and boats, explore the most daring scenarios and catch as many fish as you can. An exhilarating puzzle game chock-full of Funghis! Easy to play alone and fun with a friend, this puzzle game is great for beginner or veteran alike. The rules are simple: gather up three of the same Funghi to make them disappear. Funghis will sprout on the log depending on how many blocks you’ve cleared. When the log is full, the Funghis will be loaded into a box, earning you points. Horizon Shift ’81 is an explosive wave based single screen shooter with a real Retro feel to it. You can even play the game in Tate screen mode, which is made even better when playing with the Flip-Grip! The player controls a ship in the centre of the screen, enemies approach from the top and bottom and the player is able to switch up and down to deal with the encroaching hoard. Between dreams and nightmares, Koloro tells the tale of a young pink hair girl named Kora who embarks on a quest to find her missing sister through a stunning puzzle-platformer. Embrace a unique one-button gameplay, lovable characters, a wonderful art style and a captivating soundtrack. The videogame industry is in danger! A dishonest organization (A.M.E.) has set out to monopolize the industry and thus control the minds of the players. Developers and distributors have two options: either they take their side or else the market will end up crushing them. The freedom of creation has disappeared and only small independent studios seem to offer a small resistance. Wrapped in a mind-bending tale, the gameplay of MIND focuses on changing the very weather in order to solve puzzles: the player will cycle between day and night, modify the levels of fog and rain and even travel in time between seasons, changing the environment to advance the gameplay-driven story —indeed, the mechanics are directly related to who the protagonist is, what has happened to him and everything he is doing: a man trapped in his own mind, he must use all the tools at his disposition to escape to reality. A romance visual novel game made in collaboration with D3P Otomebu and Red Entertainment, two companies known for their creative range and production of heavyweight visual novel games. Character design and illustrations are by the popular illustrator Teita. Stretch your muscles and embark upon the ultimate marathon of Japan in a crazy party racer! 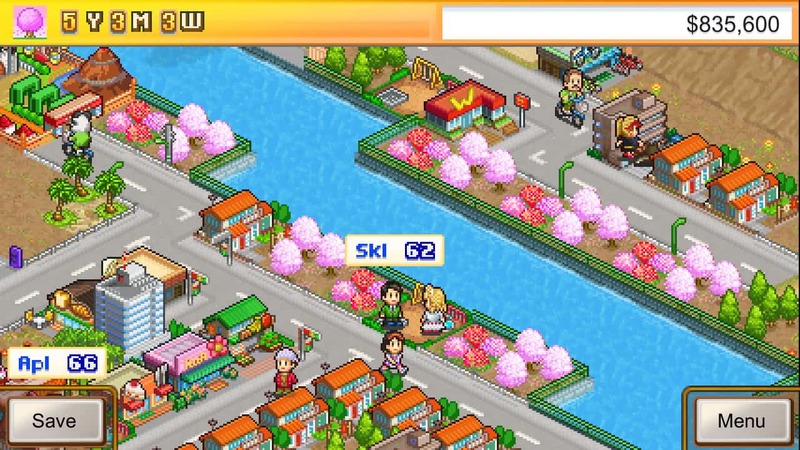 Hurdle barrels, outrun Shiba Inu and dive out of the paths of bicycles – all while throwing fruit at your opponents and dashing across planks precariously balanced over waterfalls in an unreal marathon across the whole of Japan! Guide Odium through dangerous and intense music-fueled levels to fight and stop the spreading corruption. Reach the core and save the world! Keep the balance to avoid traps, enemies and move through narrow passages. Defeat challenging bosses and discover the story behind the corruption of Odium’s world. Party Arcade is a family-friendly party game. We are creating a virtual modern arcade starting with 13 games (with more to come) where players collect tickets, unlock different equipment skins, and battle against family and friends at home or online across the world! Plumb in the sun. Pipe Push Paradise is a challenging, plumbing-based puzzle game. You’ve arrived on a lonely island faced with a hero’s calling. Rise to the occasion (push pipes around) and restore this paradise to its former glory. You are a slugcat. The world around you is full of danger, and you must face it – alone. Search for food and shelter between torrential downpours that threaten to drown all life. Evade cunning predators that adapt to catch you. Find your family before death finds you. Inspired by the simplicity of 16-bit classics, this survival platformer requires fast-paced sneaking to catch your own prey and elude ravenous predators. Grab your spear and brave the industrial wastes, but be wary of the many pitfalls and traps that litter the broken landscape. 2D puzzle action like Reversi! Enjoy it casually and feel the handwriting world! By turning over the panel and sandwiching the others like Reversi, you can see various actions such as making footholds, erasing obstacles, beating and dropping enemies. Make full use of the actions and solve puzzles to get to the goal! Confront hordes of terrifying enemies in an ever-changing world inspired by the works of H.P. Lovecraft. Sundered is a challenging and unique take on a classic genre from the creators of Jotun, now with local co-op. Welcome to the marvelous Super Hero Fight Club: 17 fabulous fighters and their superpowers, quick tactical combats, tricky modes, levels and powerups, up to 4 players rumble and single player challenges. Become the Queen or King of the Fight Club! Enter the Keep as an unsung hero on a quest to destroy the mighty wizard Watrys. Explore the dark and complex corridors, treacherous prisons and subterranean realms in this first-person dungeon crawler featuring real-time tactical combat, a unique rune magic system, and puzzle solving. This game will awaken memories of what made old-school RPG dungeons so much fun to play while you fight, hunt for hidden treasures, avoid deadly traps, experiment with magic and solve complex riddles inside the dungeon. TryBit Logic is a fun puzzle game that lets you learn about logical operations used in computer programming. Strategically combine the logical operations panels to defeat the bugs. If a bug’s switch reaches 0000 or 1111, you can destroy it! Assume the reins of a mega-conglomerate to build your very own metropolitan utopia! Stores, houses, mansions–towers! The sky’s the limit as you fashion your humble burg into the world’s most powerful fiscal force! Place compatible structures near each other to craft specialty districts or “combos,” adding flavor to your town while reaping big bonuses and boosting Land Price! Uncover the secrets and mysteries of Neuville’s Mansion. Test your logic against diverse puzzles, locate and use a variety of items, and don’t lose your sense of direction, as navigation itself becomes an obstacle in your path. Hilariously intense multiplayer battle arena! You only have one ammo to defeat your opponent. Miss your target and you will have to pick it back up or steal your enemy’s!